MS Dhoni fell to Stokes when it was 8 runs required off 4 balls. As Santner walked out to bat, Stokes bowled a full toss which appeared to be above waist height. The Umpire straight away pulled his arm out to signal a no-ball but backed out of it as the leg umpire who is supposed to make the call didn't react. This sparked a huge controversy as the CSK players lost their cool. Jadeja was first to go on an argument with the umpire and then we saw something we might have never seen before. 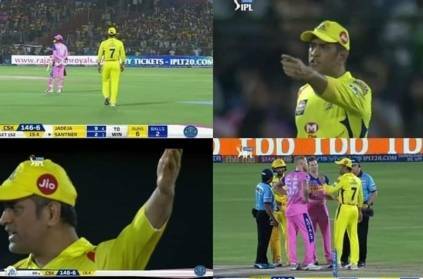 Furious MS Dhoni walked into the playing field from the player's dugout and had a heated conversation with the umpires pointing out their mistake. Normally players are not allowed to interrupt and come on to the middle and this really was a strange incident. However, it was not given a no-ball, and with 3 to win off the last ball, Santner finished off with a massive 6 taking CSK home. This page contains news relating to various facts and events. The views are generally about current affiars and general topics in diversified areas such as political, international, national, and regional issues, sports, health, travel, lifestyle, technology and business. People having similar interets on the above topics will find this page useful. No ball controversy in CSK vs RR game. Furious Dhoni !!! | Sports News.